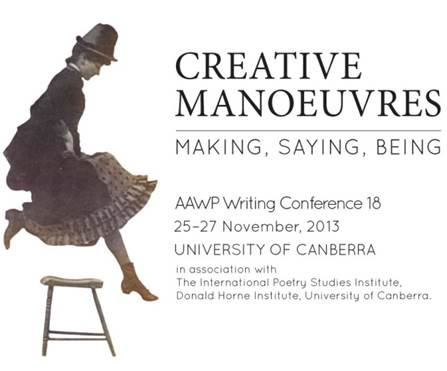 The 18th Annual Conference of AAWP (Australasian Association of Writing Programs) will be a site for creative manoeuvres of divergent kinds. It will showcase artistic works and highlight creative modes of speaking; it will enable investigations of how we make and say; it will provide opportunities to explore how creative artists engage with researchPresentations will generally be brief (five minutes each), themed and organised to encourage the exchange of ideas. Discussions will follow, allowing participants to expand on their ideas and engage with others. Full refereed papers will be published as part of the conference proceedings. Some creative sessions will be longer, and this will be at the discretion of the conference organisers. Papers are invited in three streams: 1) a refereed scholarly stream; 2) a creative stream; and 3) a general (non-refereed stream). If you have any questions, or need any more information, please feel free to contact Shane Strange (Conference Coordinator, AAWP 18).